If you want to grow your business and presence online, one of the quickest and easiest ways to accomplish that goal is through blogging. Thousands of blogs are created every day--yet few of them are turning a profit and making a financial difference in the life of the creator. 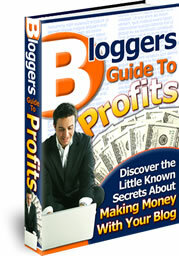 You need Bloggers Guide To Profits. Can you take different steps when you create your blog to raise the visibility of your business efforts and turn a profit? Yes, if you are reading and following the insight and teaching in this free Ebook. This resource covers all of the basics for anyone -- whether they are new to blogging or they already have experience. Everyone can profit from the tips in this resource. You are one click away from receiving a free copy of Bloggers Guide To Profits, an Ebook which I sell for $9.95.